As you probably know, we have been working on a new user experience for our documentation portal. We are now releasing the first version of the portal. There are still many things that we want to build into the portal in the not-too-far-off future. 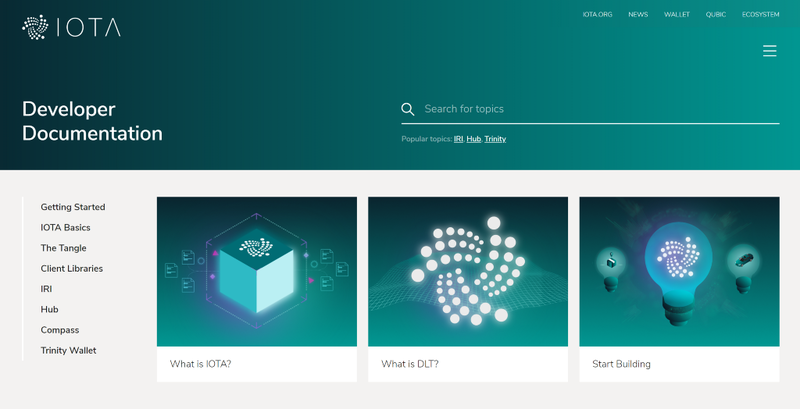 But we believe this first version will already make learning about and building on top of IOTA a much better experience. Enjoy a more streamlined experience, in line with the IOTA ecosystem. We wanted to make sure the look and feel of the website is what you’re used to when using our wallet, Trinity, or visiting the main website. We have also built a whole new stylesheet with reusable components, to make developing other experiences in the IOTA ecosystem a breeze. Have a much better user experience, both mobile and wide-screen desktop. The website is built to be usable whether you are on the go, or building great things in your office! Individual elements adjust as you’d expect to provide a great reading experience. Convenient information discovery is one of the most important parts of a great documentation portal. We’ve implemented search that works flawlessly on desktop and mobile. Go through the content from basic to advanced in a book-like reading fashion. Some of the input we received during our community developer interviews was that you enjoy book-like reading in documentation. We made this happen in the portal, and you can go from one page to the following in a logical flow. The site will guide you through your learning experience. Provide feedback on the content you visit.